Ametherm’s Video Library contains a collection of our favorite videos just for you. Our videos cover an array of topics you’ve asked about regarding Inrush Current and Temperature Sensing Solutions. We hope you find the information valuable and enjoy watching! Be sure to check back often for new releases. This video explains what a PTC thermistor is, its applications, when to use a PTC thermistor, and how it differs from an NTC thermistor. Learn more about these hermetically sealed glass-encapsulated thermistors that provide moisture resistance and high-temperature operation. A temperature sensor plays an important role in many applications. Check out this video to learn about the variety of choices you have when choosing a temperature sensor for your current and future projects. Selecting a thermistor temperature sensor can be confusing. You have a lot of options to choose from, and you don’t want to risk equipment failure or circuit breaker short-outs. So, how do you make the right selection without sacrificing performance and giving up quality? Click play above to find out! This video takes you step by step through the inrush current calculations for a capacitive circuit so that you can select the right Inrush Current Limiter with the right joules rating for your application. By popular demand, we’ve updated and re-released our video on DC Motor Inrush Current with voice narration. This video gives you an overview of DC motor inrush current and the damaging affects it can cause. Also, it looks at two key components of a DC motor and how they help to convert electrical energy into mechanical energy. In this video, we explain what thermistor beta value is, and we’ll cover the key components of thermistor beta value. You’ll learn how simple it is to calculate thermistor beta value to be sure you select the right Inrush Current Limiter for your application. In this video, we cover how implementing a power factor correction circuit improves the efficiency of an inductive load system. Additionally, we walk you through the steps to build one using an Inrush Current Limiter and a Parallel Capacitor. In this video, we give you a quick tour of all the places that you’re likely to find NTC Thermistors hard at work doing their job. Measure and compensate for ambient temperature. Learn about our exclusive line of ACCU-CURVE thermistors and the industries that take advantage of their incredibly high accuracy. 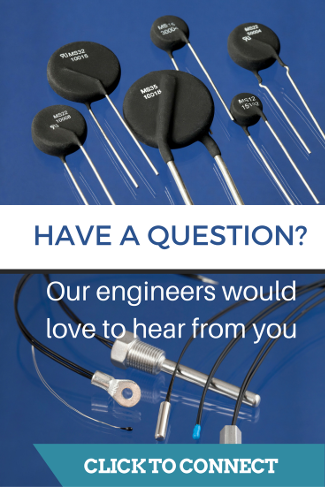 You’ll see why they are a great alternative to RTD Probes and Thermocouples. We’re no strangers to inrush current. That’s why we’ve created this handy video guide that walks you through 7 simple steps that ensure you get the right Inrush Current Limiter for your transformer. In 60 seconds, you’ll discover what an NTC Thermistor is, what its made of, and what it does. You’ll see why NTC Thermistors are the best option for temperature measurement, compensation, and temperature control. In this video, we take an in-depth look at inrush current protection that incorporates the use of both NTC and PTC Thermistors. We compare the differences between NTC and PTC Thermistors, and cover the many advantages these devices have to offer. This is a great source of information. As a valued customer, your feedback and suggestions are important to us. Let us know your thoughts by filling out and submitting the form. We appreciate your input!